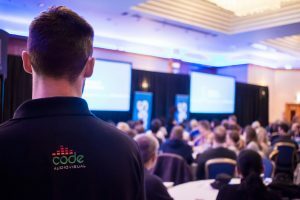 Code AV has spent the last few weeks travelling around the country with a large IT company, providing full AV support for their company conferences. 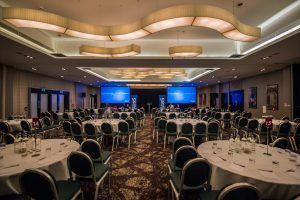 Each event hosted more than 120 of the company’s employees and management; where they had team building exercises, mixed in with the formal conference. 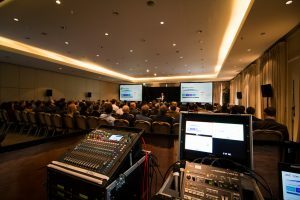 Code Audio Visual provided the same set up at each of the locations, which included London, Glasgow, Blackpool and Stratford upon Avon. Using the same technicians and kit helped to ensure continuity and a high level of professionalism at each of the events. The set up included twin full high-definition projection screens with a black drape backdrop. Audio was covered by our Allen & Heath digital mixing desk, controlling laptop playback and 6 wireless microphones, both handheld and lapels. A lectern and HD courtesy monitor was also provided. © 2018 Code Audio Visual Ltd.